I got to know this cake from My Kitchen Rules (Australian TV show). I can comfortably say that this is not a cake of Persian origin, and I am not sure whether nutmeg is used in Persian sweets. The history of Iran's baking is very much like the Indian sweets. It consisted of sweet breads, fried or cooked sweet nibbles rather than what we associate today's baking with (cakes and baking in an oven). Of course, now days most Persians claim most of Persian pastries and cakes as their own. But what we must truly realise is that the traditional Persian sweets were very limited and specific to their regions. As Iran underwent modernisation, naturally what lacked in the cuisine was adopted from other nation's cuisines. The heavy influence of the European was not only apparent in the country's social development but also in Iran's bakeries. These modern bakeries emerged in the prime of Pahlavi's dynasty when foreign ties were at their strongest. Bakers of that time cleverly adjusted each recipe to suit their own market. Distinctive Persian flavours were added to European pastries and cakes and suddenly Iran had it's Sweet Revolution! Widely accepted amongst the young and the old and voila! ... Iran's Westernisation of baked sweets swept aside the traditional sweets, and I think I can safely say that the traditional sweets became victims of Westernisation and simply became the "forgotten sweets". Now back to this cake, I do not fully understand the fuss over this cake. It is simply a gluten free cake with Persian flavours. I do not know whether the history of this cake is recorded anywhere but my dear Google informs me that the history of this cake is not very rosy. 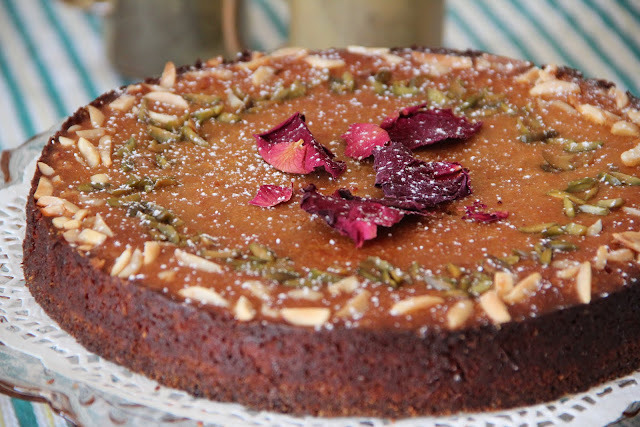 A French lady baked this cake for a Persian prince to show her love for him but little she knew that he is allergic to saffron and he dropped dead after a bite or two. The recipe is from Gourmet Traveller and I left out nutmeg but instead used cardamom, rosewater and dissolved saffron. Rub butter with fingertips until the mixture turns into crumbs. Sprinkle half of the mixture into lined baking tin (I used 26cm) and press with the bake of a spoon. Add eggs, yoghurt, cardamon, rosewater and dissolved saffron to the rest of the mix and mix with a spoon until smooth. Scatter slivered almond and pistachios over the cake. Hint: As this is a gluten-free cake, the mix is very sticky therefore, grease the baking tin generously with oil and line it with baking paper. When turning the cake out of the tin, loosen the sides with a knife first. I will look at your website. I baked this cake the other day and didn’t use saffron but still delicious. It’s so easy to make. It took me a bit longer to bake though. It’s a good dessert cake when served with yogurt. Thank you so much for recipe. Hi, we just had a slice of this cake at a cafe in Kiama… I have googled looking for the best recipe, which yours seems to be. I love that you say it is not Persian in origin. Would you mind if I blog your version, with back links of course? Thank you in anticipation. I made this cake today and loved it. I didn't have saffron or rose water unfortunately, but I got the general idea. Looking forward to trying some of the Persian recipies you have on your site. Ps. Does saffron impart a significant flavour into food, or is it more about the colour? Hi Tony, thank you for visiting our blog. Saffron is an aromatic spice with distinct colour and flavour. It is semi-sweet with honey overtones. Oh my goodness. This is heaven in a springform tin! I paleofied this a little, I traded the sugars for dehydrated coconut nectar (Coconut sugar), the butter for coconut oil, the yoghurt for coconut cream, and I added a teaspoon of nutmeg. I shared it with my new Persian friends, two, with their first bite, went straight back to Iran and are now wondering how they cam to Australia to taste Iran in a non-Iranian cake. I shall share your recipe on my facebook page along with my tweak. Thanks for trying this recipe, Jayne. I am glad that you used nutmeg in your cake to mask some of the coconut flavour. 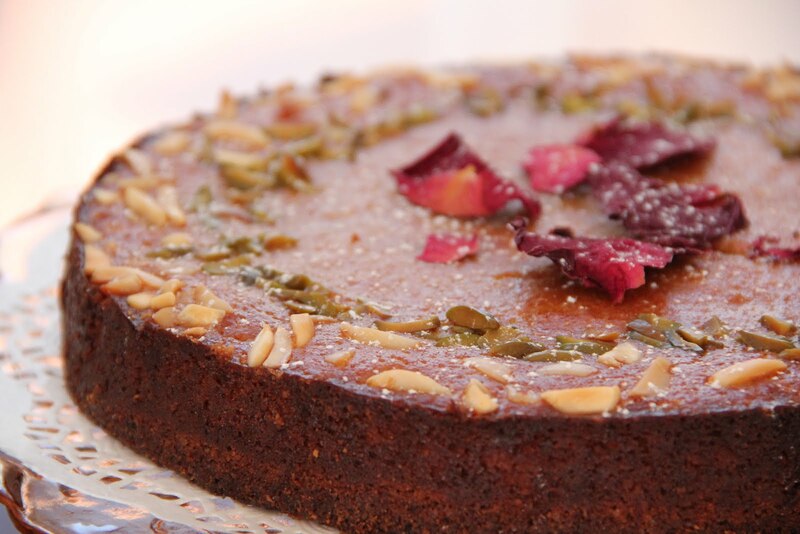 I have checked your Persian Love Cake on your facebook page and it looks absolutely divine! This cake made the happiest Persians. I will absolutely make it again, and again! This was AMAZING! we made it yesterday and absolutely love it. Took longer in the oven than the recipe stated (355°F). Will be making this many more times. I love your recipe and have baked it three times now, today being the 4th time in preparation for Christmas tomorrow. The only thing I do differently is add some fresh lemon zest to the dry ingredients. Love it! I am glad you like it :) We love it too, one of our faves!